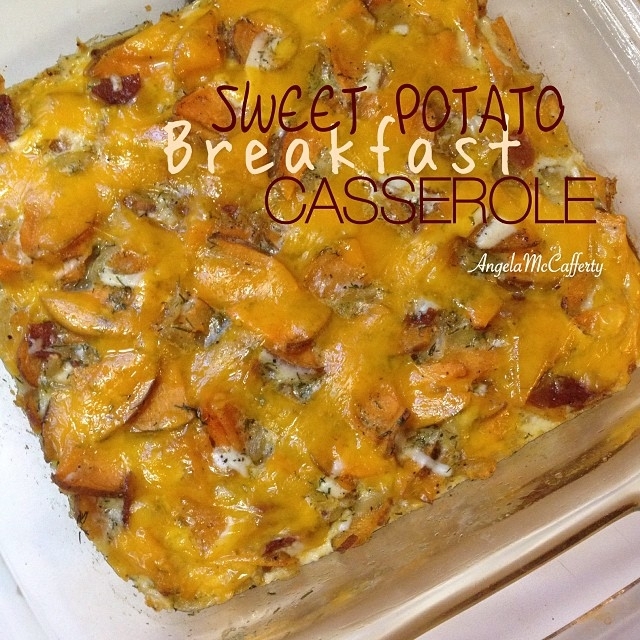 A clean and delicious comfort dish! Slice sweet potato into very thin slices like chips ( I used a multi-slicer) then roughly chop them up. Cook turkey bacon in a pan only cooking halfway through. Set aside on a paper towel. Don't rinse the pan and add in your chopped onions and minced garlic and sautee until onions are almost cooked (translucent). Then add your sweet potatoes and salt and pepper. Chop the bacon up into small pieces and add that as well. Stir to combine everything and place a lid on top. Cook for about 10-15 min stirring occasionally until sweet potatoes start to get soft. Preheat oven to 350. Spray an 8x8 pan with nonstick spray. Pour your sweet potatoes in then sprinkle on the mozzarella and lightly sitr around to incorporate the cheese.